I love it, comfortable and pretty. Very happy with this purchase. Watch us very comfortable, love the stretchy bracelet. I have a small (6”) wrist and a bracelet is a tad big, but it doesn’t bother me. 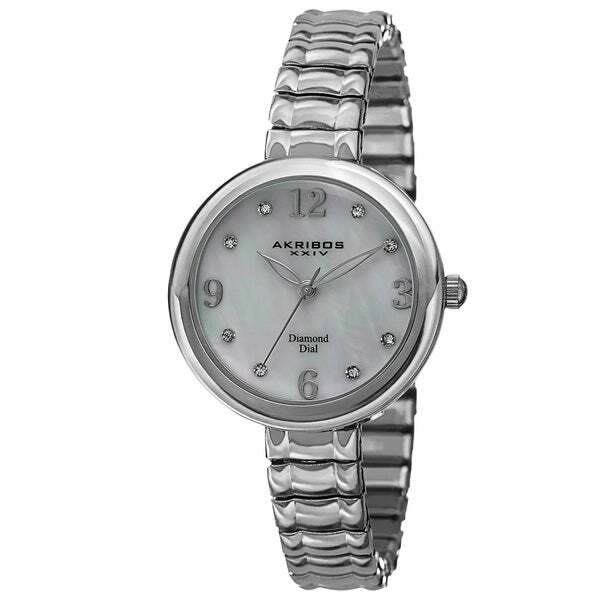 Very sleek and stylish watch! The watch is high quality and attractive. I have never had a watch with a stretch band but I'm getting used to it. I chose this type of watch because I don't want a watch to tell when TO breath, drink.and stand up. 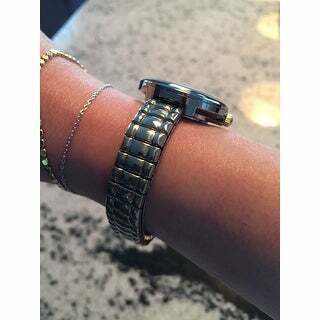 I love a stretchy band and this watch was pretty and well made. It appeared to be well made and very attractive. I did not keep it but only because I am used to having all the numbers on the face and a much larger face which makes it easier to read. I liked this watch so much I thought I would give it a try. It's not a small face by any means just a little small for me. None of that has anything to do with the quality. I can only give it a four star for now because this is a gift for my 78 year old mother. The stretch band will be perfect for her and the face on the watch will be bold enough for her to read. I'm very satisfied with this purchase. 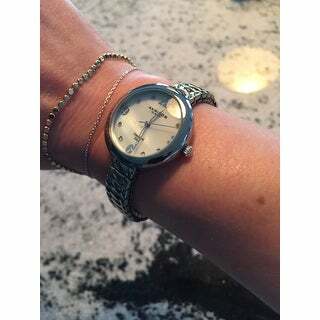 I purchased this watch as a gift for my daughter's caregiver and loved it. She's older and appreciated the stretch band so it's easier to get on/off. I absolutely love this watch that I can feel comfortable wearing, regardless what hobby I’m enjoying or the work I’m doing. Of course it’s not water proof, but I don’t do much swimming anymore. It’s great for fishing, gardening or playing with the grandkids. Overstock shows MSRP of $ and it's on clearance at $. has the watch for $ not sale price but regular retail. I'm going to be more cautious of things i buy here on Overstock and research prices before I purchase anything else from this site. I brought this for my niece and she loves everything about it.